Vive la France! … and their delicious food. One of my favorite mini treats is the mini quiche — the perfect combination of all the major food groups — eggs, cheese, cream, bacon and puff pastry. Yum. Another wonderful thing about quiche is that it is very quick to put together, and can feed a crowd. The traditional French quiche Lorraine does NOT have cheese in it (?!?!) I guess the cream was enough? But certainly not enough for me. 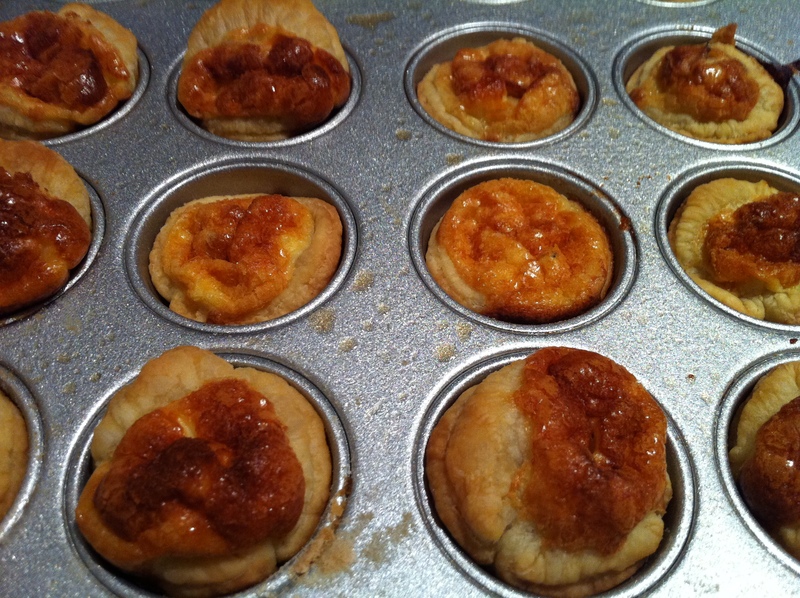 So here is a recipe for a non-traditional mini quiche Lorraine, I hope you enjoy it! 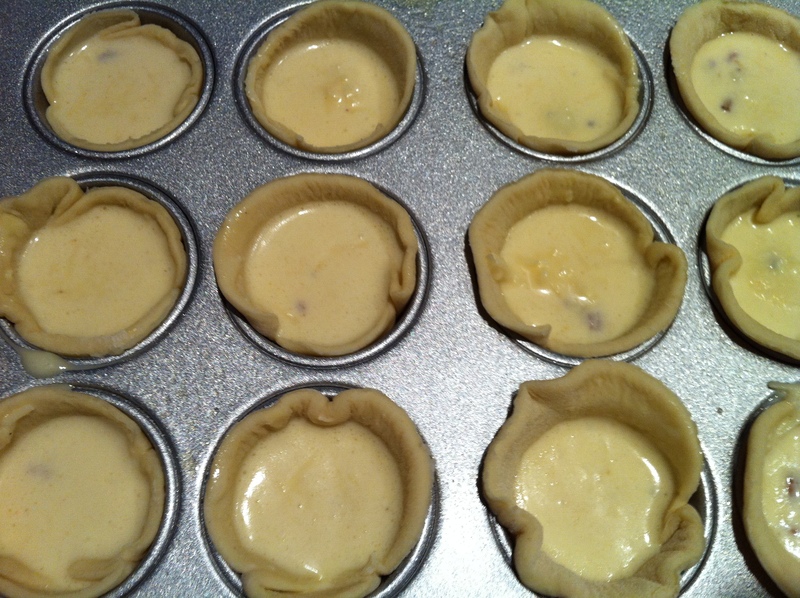 Preheat your oven to 400 degrees F. Grease a mini muffin pan (this recipe will make about 48 mini quiche). Beat the eggs and cream together, then add the salt, pepper, nutmeg cheese and bacon. Now for the shells — on a thoroughly floured surface, roll out one sheet of the puff pastry until it is just a bit larger. Using a cookie cutter, or drinking glass (I used the latter) of about 3″ in diameter, carefully cut out circles and poke them into the mini muffin pan. Next for the filling. 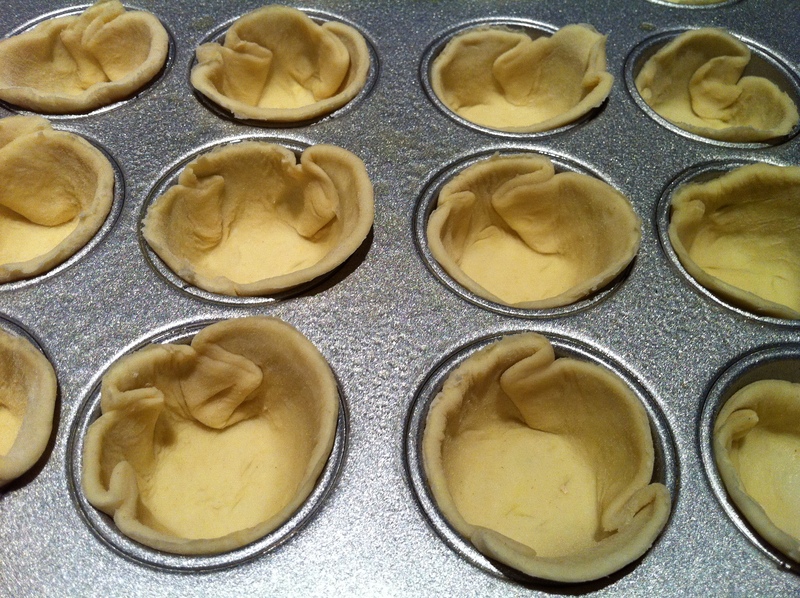 Using a tablespoon, carefully fill each shell with the custard mixture. Make sure it is evenly mixed so each gets a little bit of bacon, cheese, etc. Bake them for about 18 minutes or until they are puffed and golden. Cool slightly, then enjoy! I’m bringing these over to Amy’s new apartment tonight for a little housewarming picnic — hopefully she likes them! This entry was posted in Bacon, Eggs, French, Quick & Easy and tagged appetizer, bacon, eggs, french, gruyere, Lorraine, puff pastry, quiche. Bookmark the permalink. Lucky me that I got to taste these firsthand last evening! DELISH. ADDICTING. YUM.